The study of a sustainable method for separating methane from carbon dioxide in the production of biogas, paid Mirtha Lourenço, the prize for "best poster" in a symposium on functional hybrid materials. The poster of the doctoral student from CICECO/UA was the best among the 35 works presented from 25 to 27 Mayin Stockholm. The work consists of synthetic materials designated Periodic Mesoporous Organosilica (PMO), functionalized amines to be used as adsorbentes in the biogas purification, ie, the carbon dioxide separation (CO2) methane (CH4) in mixtures containing these gases. The biogas produced during degradation of organic matter, have main contaminant of carbon dioxide (about 35%), which precludes its use. The separation of these two gases is of vital importance for the use of biogas in the current context in which it is seeking more sustainable energy alternatives. Presently, CO2 is removed from the biogas using chemical solutions with amine functional groups of the type which selectively absorb that gas. Although apparently inexpensive, this method turns out to generate high economic and environmental costs, since there is need to find ways to recover or eliminate chemical solutions containing CO2. Furthermore, the solutions easily corrode equipment, loose absorptive capacity in the presence of other contaminants and are volatile (and energy demanding systems for cooling). There is therefore the need to find methods sustainable and economically viable alternatives. In this context, it is quite attractive to use a solid material which fixes selectively CO2 on its surface by adsorption processes, can be easily regenerated. 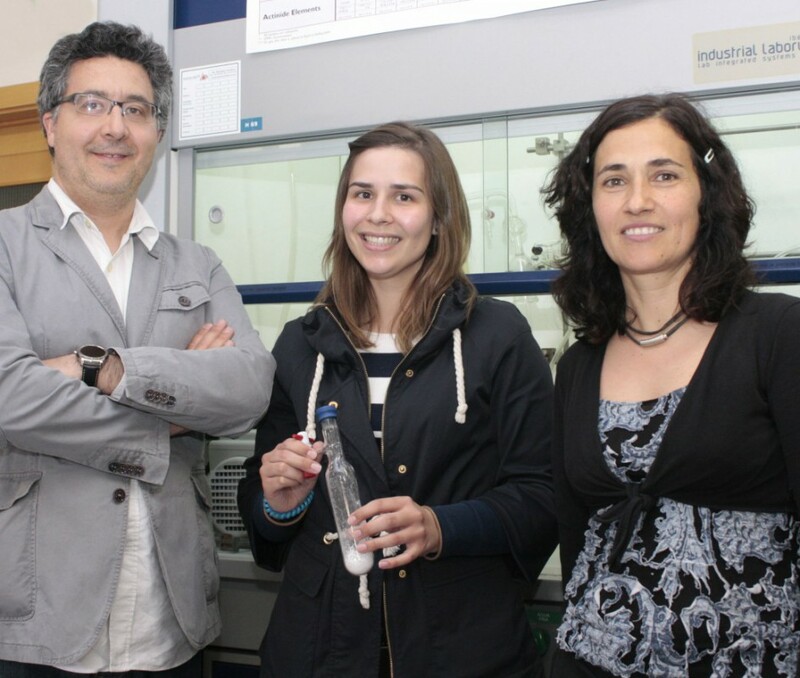 In the past three years, Mirtha Lourenço have been dedicated to the design of adsorbent materials for CH4 CO2 separation, as part of his doctoral thesis under the guidance of Paula Ferreira and José R. Gomes, both Principal Researchers of CICECO. The PMO proposed in this project for the separation of CO2 / CH4, explains Mirtha Lourenço, are organic–inorganic hybrid porous materials functionalized with amines, able to interact with CO2, separating it from CH4. These materials are selective; thermally and chemically stable; and easily regenerable. The chemical functional groups of the amines family are bonded chemically to the surface of the material, which prevents its evaporation and corrosion of equipment. Symposium "Functional hybrid materials: structure elucidation molecular from to macroscopic level", promoted by the action COST MP1202, were the contest 35 works in poster format, originating from 13 countries, including Portugal, Spain, France, Italy, Sweden, United Kingdom, Finland, Israel, the Netherlands, Switzerland, Russia, Germany and Belgium. The poster winner entitled "Tuning functionalized periodic mesoporous phenylene-silica for CO2/CH4 separation: DFT calculations and gas adsorption measurements" is written by Mirtha Lourenço, Christophe Siquet, Mariana Sardo, Luis Mafra, João Pires, Miguel Jorge, Moises L . Pinto, Paula Ferreira, José RB Gomes. The awarded prize was funded by ISGS - International Sol-Gel Society. ISGS is an International non-profit organization which aims to support the progress of science and technology "Sol-Gel". This technology has evolved enough to be applicable in multidisciplinary areas involving chemistry, physics, biology, materials science and nanotechnology. The main advantages are the materials handling structure at the molecular level, low cost, low environmental impact and biocompatibility. The PMO materials used in this project are synthesized by "sol-gel".